At least a few people from the Sinhala community watch South Indian films in Tamil. Before the arrival of Lester James Peries's films in Sinhala, almost all Lankans watched Tamil films. They may remember some films which had good story lines and depicted some human values, even though they lacked cinematic qualities. My purpose here is to introduce two of the films I had seen in the 1960s and 1970s, especially to the younger cinegoers. Last week we looked at Sridhar's Nenjil Ore Aalayam. This week let's know about Mani Oasai (Sound of the Bell) This film is an adaptation from the French novel "Hunchback of Notre Dame "by Victor Hugo. As usual in most Tamil films the theme of sacrifice is focused in this film too. A kind-hearted deformed half-brother sacrifices his life for the happiness of his half-sister and others. Although the theme has nothing unusual about it, the plot develops in an interesting fashion and ends in a sordid climax. The characterization of the main character is well-contrived as to give a sustained performance to the player. 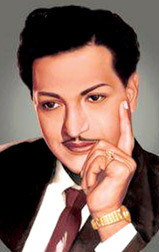 Kalyan Kumar plays the role of the deformed son. M R Radha plays the role of a hard-hearted father. In watching early Tamil films one has to 'willingly suspend disbelief' and whether the character is round or flat or whether psychological congruities tally and other aspects of cinema. Mani Oasai pleased me then because the acting, dialogue, direction, editing, lyrics, music and photography were all around good. The outdoor photography of Karnan was befitting. An understudy of Sridhar-P Madhavan has directed this film. This was his first film. The songs were based on Tamil folk tunes, which was refreshing. Kalyankumar as the main character gives a creditable performance while M R Radha's performance was less dimensional. Pushpalata's role was not essential to the story though.Vijayakumari does credit to her role. Muthuraman continues to give satisfaction as a good actor maintaining the standards he achieved in Nenjil Ore Aalayam and Sumaithaangi. The usual 'masaala' ingredients like frequent songs, dances and slapstick humour were absent in this film. Sumai Thaangi (Bearer of Burdens) is an emotional drama and a box office commercial film. It is again a story of sacrifices of a young man in a middle-class family who takes over the burdens and responsibilities of the whole family at the expense of losing his girl friend. What gives strength to the character is the development from a gay, carefree, extravagant youth to a serious, sincere and sympathetic man. Behind the outer cover of irresponsibility the potentialities like virtue have lurked in this man. There are several sequences sentiments expressed in the film, but they are carefully knitted together to form n organic whole and they create a sympathy for this lonesome martyr. Sridhar's direction is well-planned but in the same breath one could say that it is a disappointment tot hose who had expected something better than his earlier film Nenjil Ore Aalayam. While the later was based on his own story, Sumai Thaangi was adapted from a Tamil magazine story. Perhaps the melodrama in the story did not allow him to be economical in the presentation of the story as a film. Gemini Ganeshan plays the serious role with confidence successfully.